Decorating eggs for Easter; it's a time-honored tradition in kitchens across the U.S. that I — and many others — love. We don’t do it in Brazil, where I am from, but I've incorporated it to my celebration as soon as we moved to California. It’s hard to choose a style as there are endless creative ways to decorate Easter eggs. I love to create opportunities for parents to work with their kids, so I chose words for the adults and easy doodles for the young ones. It’s simple enough for kids to get their hands dirty with just a little help. 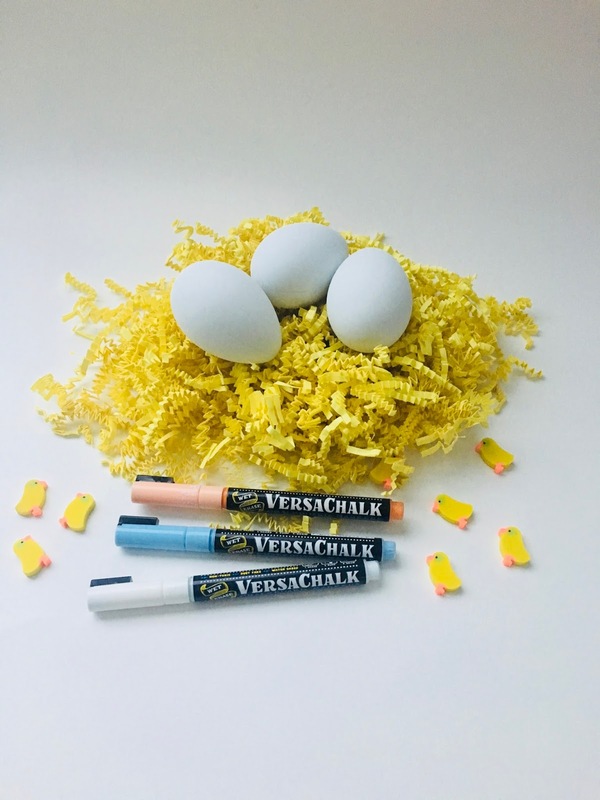 Plastic Craft Easter Eggs – You can find them in craft stores or buy them online. Fine point VersaChalk markers – I decided to go for pastel colors as I believe that they are the most suitable for Easter. You can find them here. Kids doodling eggs: Ask your children to choose patterns or designs that are easy for them to reproduce on the egg surface. Let them try on paper first, then doodle across the surface of the eggs. To make the egg-drawing easier, place them on top of a roll of tape. Hold the egg with one hand and doodle with the other. Parents calligraphy eggs: For the grown up, I suggest a little bit more sophisticated approach. Spray gold paint on a section of the egg. Use tape to mask the section you want to keep white. From a distance of about 6 inches from the egg, keep moving the spray rather than stopping in one area. Start with one side of the egg. Allow it to dry for about 5-10 minutes and repeat on the other side. Let it dry. Then jazz up the eggs with inspirational words, coordinating them with the colors that your kid used to create their doodles.